Just like in humans, nutrition is an important cornerstone for the health of your pet. And just like in humans, nutritional requirements change over time, depending on age, lifestyle and medical conditions. For example, cats and dogs with kidney disease require specialized diets, and small breed dogs are often prone to urinary and dental disease that can be prevented or managed by an appropriate diet. 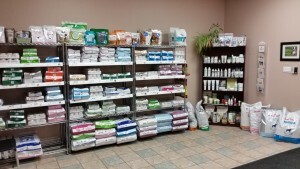 Our veterinarians have ongoing formal training based on the latest research on pet nutrition and are the most qualified to give your pet individual nutritional advice. A dietary recommendation should be considered a prescription, being just as important as a medication, to give the right food and appropriate amounts. For example, over feeding can lead to obesity, a common exam finding. Our veterinarians work with you and your family to create weight loss plans that are tailored to your individual pet(s). Other medical conditions, including diabetes, kidney or liver disease, and food allergies also require strict feeding to ensure your pet remains as healthy as possible. At Avonlea and Hollybank Animal Hospitals we primarily carry Royal Canin diets, with Royal Canin being a company that we all trust, providing studies and proof of the efficacy of their diets. Most of us even feed it to our own pets! Most pet foods sold in grocery and pet stores will carry an “AAFCO claim”, meaning it has been formulated to technically meet the requirements for nutrition. However, most of these foods have never had a single feeding trial with real pets. You would never feed a food to your child that has not been tested, so why feed this to your pet? Royal Canin does extensive studies and have fed their food to real pets for years, providing not only palatability studies, but long term effects and benefits are considered as well. In terms of safety and quality control, Royal Canin exceeds expectations! Royal Canin employs the use of Near InfraRed Spectroscopy (NIRS). This is a system that compares the molecular “fingerprint” of an ingredient to a database of standards. If the results for the incoming ingredient do not match the standard, then the ingredient is removed from the processing immediately. With this technology you can be assured that Royal Canin Veterinary Exclusive products are free of any contamination and are 100% safe for your pet. Many pets have unique dietary requirements. Very few commercial pet foods offer the ideal formulations to address special calorie, medical and allergenic needs. We can provide you with feeding recommendations that will address dietary requirements. For added convenience, we also stock veterinary-approved diets.